After Jodie Whittaker acted surprised to find the sonic screwdriver behind her name card on the panel, she held it up for all to see while it was announced that — surprise! — it was now available for purchase at the BBC booth in the exhibit hall. Within minutes, BBC-America had also sent out this photo of the sonic in its packaging. Yes, it does look like it’s pulled from various pieces of alien tech. 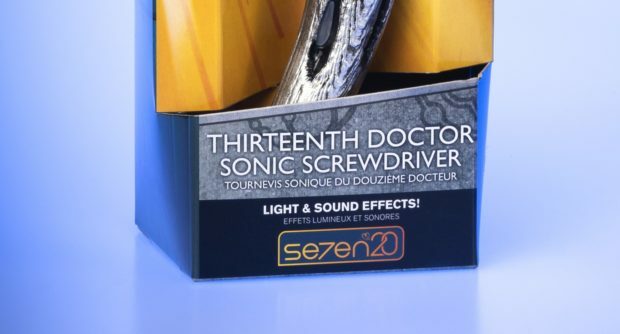 It’s also a little reminiscent of the sonic lipstick that River Song has, but it also seems more organic and sharp-edged. That it might be used as a blunt weapon seems doubtful, as Whittaker reminded the audience that the Doctor remains a pacifist. We’ll see for sure sometime in the Fall — Chibnall did confirm that the sonic screwdriver will be assembled in the first episode. In the meantime, kids (and cosplaying adults) can have fun imagining its abilities.